Category Archives: What’s stirring in my pot? Posted on October 30, 2012 by Madame B. Posted on October 24, 2012 by Madame B. Posted on October 17, 2012 by Madame B. 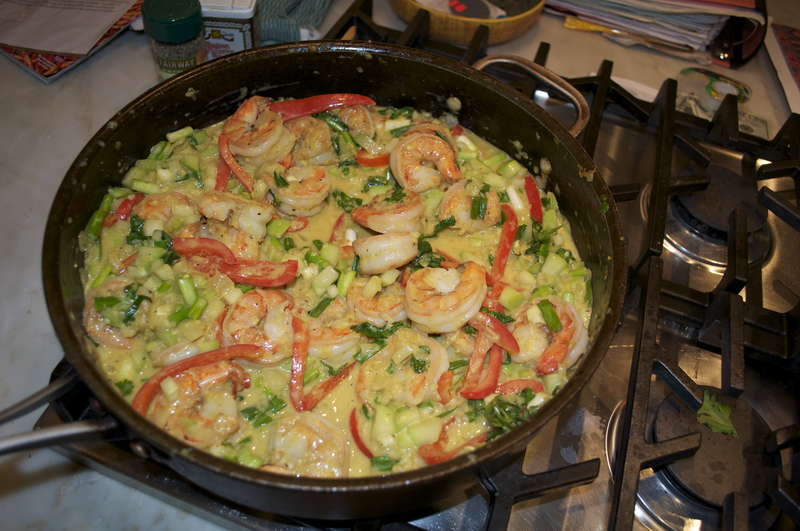 Posted on October 16, 2012 by Madame B.
Curried Shrimp with Coconut Milk is a family favorite and so easy to make for such an impressive dish. What makes this dish so unique is Chayote (christophine) Squash which has its roots in Mexico. You can find these in the tropical fruit and vegetable section at the grocer. The colors of the vegetable and the smell of the curry make this dish the ultimate sensory experience. This recipe is from the Food Network www.foodnetwork.com. Enjoy! When foam subsides, add shrimp and cook until just pink. Remove from pan and reserve. Add remaining 1 tablespoon of butter. When it melts, add the onions until softened. Sprinkle 1 tsp. salt, 1/2 tsp. pepper, curry powder, garlic and ginger over the onions, reduce heat to low, and cook gently about 5 minutes until softened and translucent. Add red pepper and chayote and cook 5 minutes. Add about 2/3 of the coconut milk and simmer, uncovered, 10 minutes to bring flavor together. Add Shrimp back to the skillet along with the scallions, cilantro leaves and lime juice. Taste and adjust seasoning adding more pepper if necessary, adding more coconut milk for a soupier consistency. Serve over rice. I prefer Jasmine. Posted on October 11, 2012 by Madame B. Posted on October 9, 2012 by Madame B. How could something so simple be so perfect? My family adores roasted peppers and I always make them to keep in the fridge. They work in salads, on sandwich’s and as a pasta sauce or just by themselves. There are many ways to peel peppers but I think this method is the easiest. Put peppers on baking sheet or roasted pan. For 20 minutes leave on one side and then for another 20 minutes place them on the other side. Take out of oven and individually wrap peppers in aluminum foil and let sit for 20 minutes. When ready peel the peppers, skin should come off easily. Remove seeds. You can leave them whole or cut in strips put in airtight container with olive oil and large pieces of garlic, chopped parsley. Take the garlic out after a day otherwise it gets garlicy. These will stay in the fridge for two weeks. Enjoy! Posted on October 8, 2012 by Madame B. Posted on October 7, 2012 by Madame B.